Guerrilla artists beware. A decade after 9/11, New York City is still on high alert, and its police officers are not art connoisseurs. When a passerby noticed the designer Takeshi Miyakawa hanging shopping bags from trees at 2:00 in the morning, the person called the police, reporting a possible bomb threat. 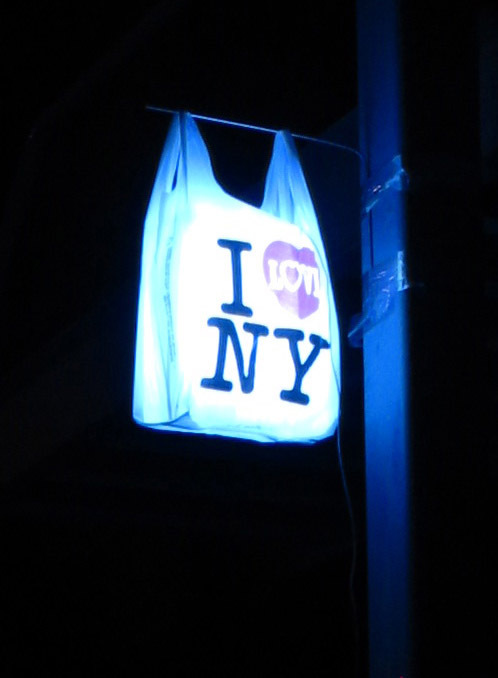 The shopping bags, emblazoned with the “I♥NY” logo, were meant to be light sculptures, illuminated with LED lights. Miyakawa had designed the sculptures as a tribute to the city in honor of New York Design Week. But Miyakawa had not secured the proper permits, and the wires coming from the bags looked suspicious. The bomb squad was called in and the artist was arrested. Unlike the self-proclaimed artists who planted mysterious packages on the city’s subway in 2006 to show the ineffectiveness of the “if you see something, say something” campaign, Miyakawa’s art was never intended to provoke concerns. Yet, he was charged with planting “false bombs.” And when he was arraigned the following day, Judge Martin Murphy ruled that Miyakawa be detained for 30 days while he underwent mental evaluation. Thanks to the efforts of his friends and his lawyer, he was released on bail after six days but is scheduled to appear in court later this month, according to a recent report in the New York Times. You can see more photographs of the light sculptures on the designboom blog and furniture designed by Miyakawa on his web site. Miyakawa’s installation of glowing “I Love NY” bags was meant as a tribute to the city, in celebration of Design Week, but when he left one in Williamsburg on Friday, the bomb squad was called in and all hell broke loose. Police arrested him later on fees of planting false bombs.